See how he has grown up, yet still looks like a young puppy? He loves toys, balls and hunting, usually can outrun any squirrel but doesn’t often catch it. Sometimes thinks he can fly like a bird, (he doesn’t catch those often) His hunting instinct is there in his genes. He will investigate any hole and will dig if he thinks he can get away with it! Rabbit holes are his absolute favourite. He can be trusted not to eat things that do not belong to him. Has good manners, should understand most commands, but still may be a little stubborn. However he will love to go with you everywhere. They thoroughly love visiting people and children in the park. 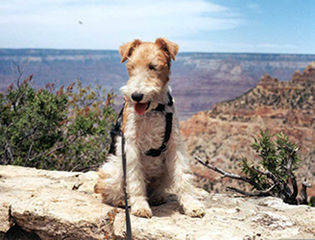 This little fellow in the picture was pictured in a Canyon having climbed with his Master to the highest part. He had his own backpack with his lunch in it and his bottle of water! After that exercise, he was ready for bed just about as soon as he arrived at the hotel. However I do assure you that he was quite ready for the next day’s trip.